Fox Release the First Official Images from Ridley Scott's 'PROMETHEUS' & they are Amazing! 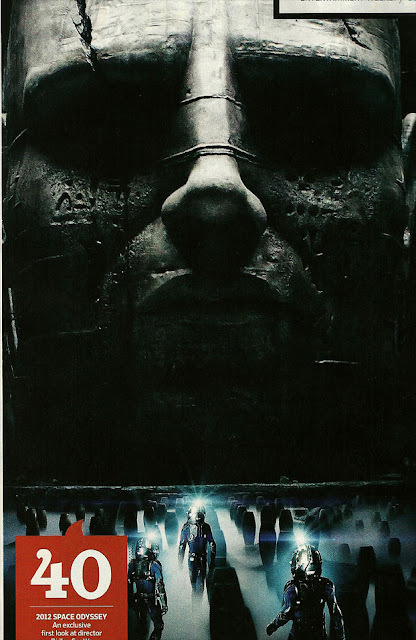 Finally, ..finally 20th Century Fox have decided to release something other than a f**king font for Ridley Scott's upcoming Alien prequel Prometheus. 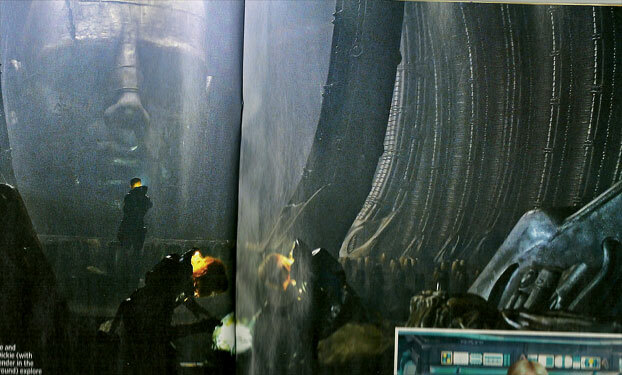 Clouded in secrecy & speculation for the past two years, leaked images & grainy trailer stills are all we had to get a sense of Prometheus. Now we feel its finally on its way. 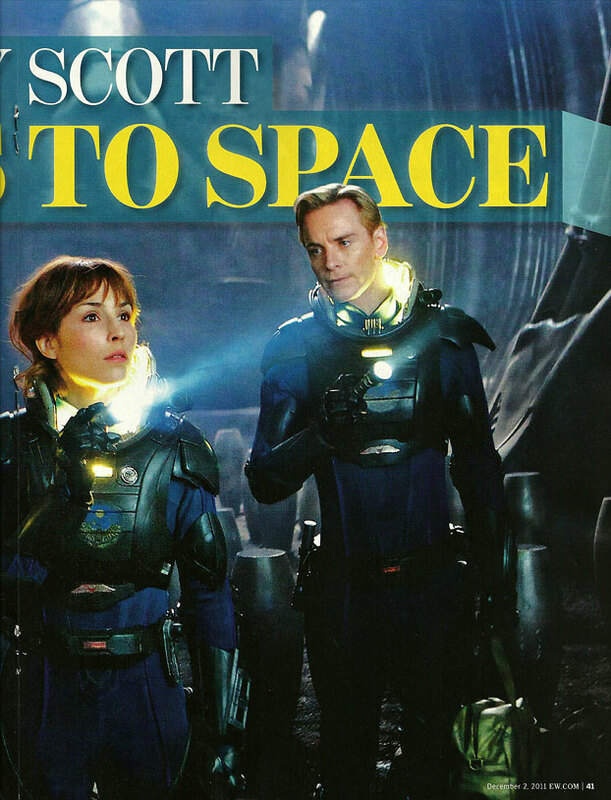 In this, the latest issue of Entertainment Weekly [Issue #1183] [the Thanksgiving edition, are they serious?] we find some totally amazing stills. 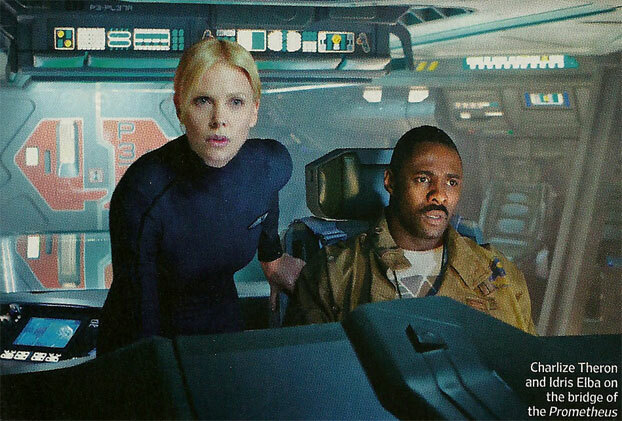 The images reveal our first 'official' look at Noomi Rapace as Elizabeth Shaw, Logan Marshall-Green as Holloway, Kate Dickie inspecting one of the ampules, Michael Fassbender as David approaching the Giant Head, Charlize Theron as Meredith Vickers & Idris Elba as Captain Janek on the bridge of the Prometheus. Some of us are already familiar with the large room of cannisters we've previously seen in those leaked photos but this time we also get an amazing look at the Giant Head in the large room we have heard so much about & EW reveal Scott refers to this as "the Ampule room". An 'ampule' is a small glass vial used in a scientific laboratory to preserve a sample, usually of a liquid. With the release of the promo images things are starting to get serious & by that I mean a lot of marketing is headed our way including the first teaser trailer. Hit the jump to check out the images. Click on the images to view full size in our Gallery. 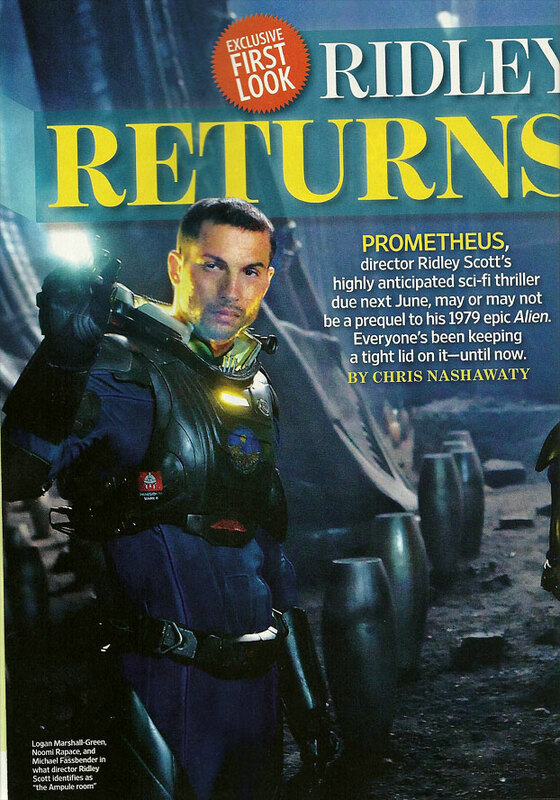 Entertainment Weekly #1183 hits shelves in the US this December 2nd. 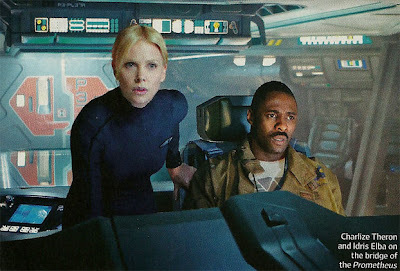 Additional The Playlist caught up with Charlize Theron [who plays Meredith Vickers] over the weekend while doing promoting Young Adult & the actress revealed her co-star Patrick Wilson in Prometheus, appears "all in flashback" in the film & that they don’t actually share any scenes together. Also its worth noting that this is the first official confirmation that 'Prometheus' is the name of the ship. No s**t Sherlock. 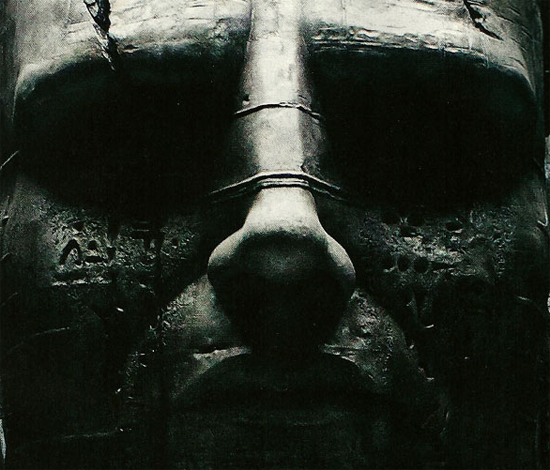 Prometheus arrives in 3D on June 8th 2012. Written by Damon Lindelof & Jon Spaihts Prometheus also stars Sean Harris, Kate Dickie, Rafe Spall, Logan Marshall-Green, Guy Pearce & Patrick Wilson. Just noticed a couple of sites still running with this one but Ben Foster is in no way involved in the movie. The scans from EW come via ShockTillYouDrop & BloodyDisgusting. I'm reading: Fox Release the First Official Images from Ridley Scott's 'PROMETHEUS' & they are Amazing!Tweet this!